The Vizsla Temperament: Ready To Fulfill the Needs of the “Velcro Dog”? Owners of the Vizsla describe his quiet temperament as gentle and affectionate. They say that having a Vizsla is like having a shadow because he loves to follow you wherever you go. He is constantly by your side, both around the house and outside of it. The Vizsla is classic for his public display of affection. He doesn’t think twice about showering you with plenty of hugs and big, wet kisses. You can describe the Vizsla temperament in many different ways. A “heating pad with a heartbeat,” an “ADD (attention deficit disorder) dog,” a “love bug,” a “leaner”—all these terms aptly depict the lovable nature of the Vizsla. Vizslas make great family pets, especially for people who love to live active lifestyles. 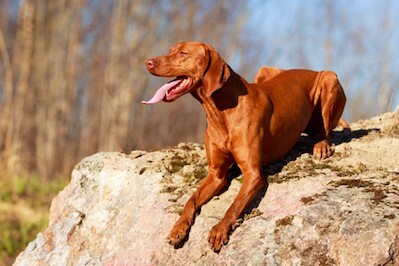 The Vizsla dog breed makes a great exercise buddy, whether you love to run, walk, bike, hike or jog. Vizslas were originally dogs of the outdoors, so they are happiest when they live with families who love being outside as much as they do. 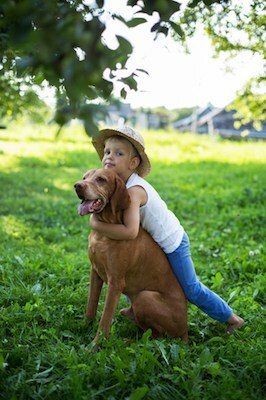 The energetic Vizsla temperament also makes him an excellent companion for energetic kids. However, he may be too frisky for younger children, like preschoolers and toddlers. Otherwise, Vizslas can play for hours on end without so much as a huff or a puff. They have more energy than even they can burn off! The Vizsla’s hunting instincts make him yearn for daily stimulation, both mentally and physically. Thus, owners of the prancing and continually high-strung Vizslas need to help the Vizsla find ways to let off steam. Without adequate exercise, this highly energetic dog can become destructive and can develop other undesirable behaviors. Taking your pet for a walk or a jog for a couple of miles every day, regardless of the weather, can easily rectify this issue. Just like any other breed of dog, the Vizsla needs to know you are his pack leader. He needs to understand that you are the Alpha figure who takes charge, issues the orders and rules the pack with a firm hand. He will expect you to keep him on a tight leash – don’t let him down! Like most active dogs, such as the Weimaraner and the Border Collie, a Vizsla needs somebody who is strong and firm with him, someone who can show him his rightful place in the household hierarchy. Otherwise, he can become rather stubborn when he is unable to recognize a strong authority figure in his pack. The Vizsla dog temperament demands that you always be nearby, ready to nip any negative behavior in the bud before it can become deeply ingrained. Since the Vizsla was originally a hunting dog, the instinct is still very much ingrained in them. Thus you should never trust your Vizsla with rabbits or hamsters. They can get along well with cats though, so long as you raise them together. Vizsla owners lovingly refer to them as “Velcro dogs” for the way they tend to stick to you or other members of your family as much as possible. This is why they can easily suffer from separation anxiety and depression when left alone for long periods. They often manifest these problems with excessive barking or howling or destructive chewing. This perhaps overly affectionate Vizsla temperament traces back to his roots as a hunter’s buddy, where he needed to stay alert and not stray too far from his master. Vizslas have no problems with training, and you can achieve the best results if you start early. Be prepared to be calm but assertive when issuing commands to your dog. Vizslas are not domineering, but they do tend to test boundaries, particularly when they are bored or bursting with pent-up energy. Conduct your training sessions with your dog's favorite treats. Just don’t go overboard, else you risk making your dog overweight or even obese. And don’t hold back on the lavish praise, belly rubs, and head petting. He needs to be absolutely sure of when he does well so that he can keep doing the things that please you. Experts trace the first written mention of the Vizsla all the way back to 1357 in a publication prepared on order by King Louis I of Hungary. Magyar tribes valued the Hungarian Vizsla for his hunting abilities. In fact, early aristocrats preserved the Vizsla breed for centuries, ferociously protecting the breed and continuing to breed the “yellow-pointers” to preserve their hunting skills. There are records of letters and other writings depicting the fierce respect the people of that time held for the Vizsla. The Vizsla has come under the threat of extinction a couple of times throughout history. However, he is a hearty dog, surviving everything from the Hungarian Revolution of 1848 to both World Wars I and II! If you don’t want a high-maintenance dog when it comes to grooming, then you have the perfect dog in the Vizsla. His coat is short and sleek, and he does not have an undercoat. He does shed from time to time, so an occasional brushing is in order. Give him a bath when his coat gets dirty or stinky and check his ears regularly for any build-up or signs of irritation. Trim his nails regularly to keep walking comfortably for him and be sure to occasionally brush his teeth for good dental hygiene. As for the breed standard in colors, the Vizsla comes in golden, golden rust, and red golden. The average height for the Vizsla is between 21 and 25 inches, and he tends to be between 40 and 65 lbs. The Vizsla’s life expectancy is between 12 and 15 years. People tend to compare the Weimaraner with the Vizsla, and this is because both dogs are similar in both size and color. Both dogs are of medium height and have short coats. However, the Vizsla is smaller-boned than the Weimaraner but longer in the body. Weimaraners tend to be grayer in color, while Vizslas are more golden. You can also tell the dogs apart by their ears. The Weim’s ears are higher on his head than the Vizsla’s. In addition to the smooth-coated Vizsla is the Wirehaired Vizsla. The Wirehaired Vizsla temperament is identical to that of his smooth-coated counterpart – just his coat is different. As for shedding, the Wirehaired Vizsla does not shed much and only requires minimal grooming to keep him looking his best. Wipe him down with a damp cloth every now and then between baths. Just because he has a different coat does not mean the Wirehaired Vizsla is hypoallergenic. In fact, no dog is. The only way to tell if you’re allergic is to spend a significant amount of time with the dog. Interestingly, though, the Wirehaired Vizsla is slightly more affordable than the smooth-coated Vizsla, coming in at between $800 and $1,000 on average. Are you interested in bringing a Vizsla puppy into your family? That’s wonderful! You can find a Vizsla for sale either from a Vizsla breeder or through a local rescue or adoption agency. The average Vizsla price is between $1,000 and $1,800. Generally, the purer the bloodline, the more you’ll pay for the dog. Price all depends on what a breeder decides to charge and the dog’s history and parentage. If you want a show quality dog, then expect to pay more on the higher end. If you would like to adopt a Vizsla, visit the website for the Vizsla Club of America. The group has information available on how to adopt a Vizsla, including applying for a grant to support the rescuing of purebred Vizslas. The group will also help match you with an adoptable Vizsla that will be a good match for your family. Most Vizslas who are available for adoption are adult dogs who wound up in the shelter through no fault of their own. For example, many dogs end up in shelters when their owners can no longer afford to take care of them. There are many benefits to adopting an adult rescue dog. They typically have had training, so they are housebroken and less destructive and rambunctious than puppies are. If the Vizsla Club of America does not have any dogs that are a good match for you, check out the “stock” at your local animal shelter. If you are open to a Vizsla mix, then you might get a faster call back! The adoption fee varies, depending on the organization. Local shelters typically ask for a donation between $75 and $150. Private rescue groups, however, often charge a higher fee for their specialized services. Vizslas adopted through rescue groups and animal shelters are always spayed/neutered and vetted prior to your adopting them and bringing them home. Another option is to buy Vizsla dogs for sale from a breeder. However, this requires additional research. Your first move should be to review the breeder. Most Vizsla dog breeders have websites and social media profiles. You can review their online reputation to discover if any customers have lodged complaints against them in the past. NEVER buy puppies from pet stores or brokers. Breeders who use these options are only in it for the money and do not care about the quality of the dogs they sell. You also need to stay on your toes when you visit the breeder. During the visit, look for potential signs that the breeder is not taking proper care of the dogs. Report any breeder who keeps their pets in dirty or cramped conditions. You should also avoid buying a Vizsla dog from a breeder who cannot provide the necessary medical records. This means the breeder has not had the dog properly scanned for any potential health conditions, which can translate to you paying thousands of dollars for a sick dog. 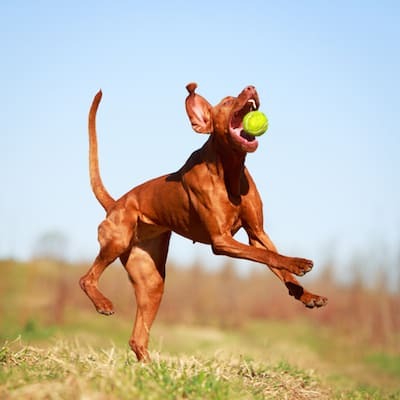 Does the Vizsla Temperament Work for You? The Vizsla’s temperament fuels his desire to behave like a puppy until he is around 3 or 4 years old. In fact, experts on canine behavior rank the breed high in playfulness and low in aggression and tendency to snap or bite. So, do you think you are ready to be the leader to the outgoing, affectionate, and frisky Vizsla?